This vehicle has returned to service at Riverside Depot. 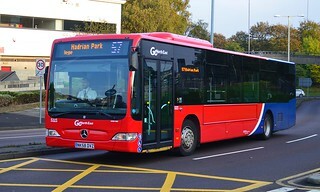 Prior to returning to service, this vehicle has received Go North East's corporate livery. This example carries the tagline "Recharge your batteries | Many of our buses have power sockets on board". This vehicle has returned to Go North East following internal refurbishment and repaint into Go North East's corporate base livery. It is currently undergoing preparation for service at Saltmeadows Road Depot prior to allocation to Riverside Depot. 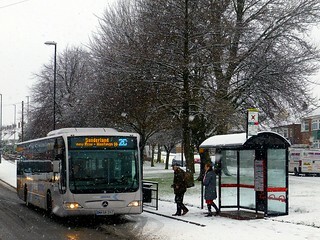 This vehicle has received the tagline "Never miss your stop | Many of our buses have next stop screens and announcements". Acting as a spare vehicle for "Crusader" service 27 and "Citylink" service 57, this vehicle has been fitted with free customer Wi-Fi. 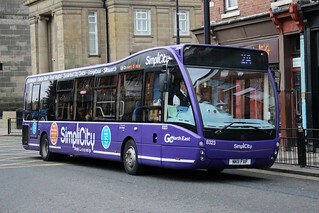 This vehicle has been repainted into Go North East's new corporate livery. The new livery design is a a lot more eye-catching and features a two-tone base livery, with the traditional key colour of red towards the front of the bus, and non-metallic dark blue towards the back. It is thought that further vinyls will be added at a later date, in order to reflect the quality and customer values of Go North East. 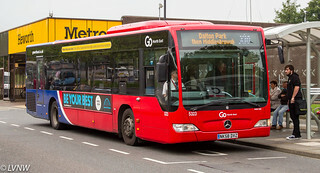 As a result of service revisions at Deptford Depot and the change in allocation to some of Deptford's services, this vehicle has transferred from Deptford Depot to Riverside. 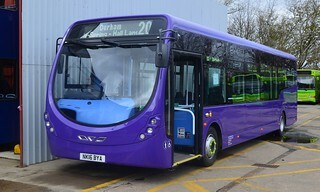 Until July 2016, this vehicle will act as an additional spare vehicle for "Crusader" service 27, "Blaydon Racers" service 49 and "Citylink" service 57. 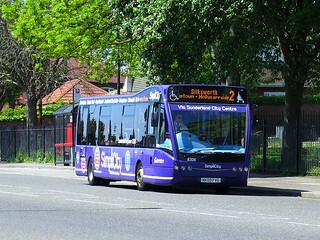 In line with a major network review in Sunderland commencing 25th January 2015; this vehicle is now allocated to service 61, operating between Sunderland, Dalton Park and Murton. At the moment, it carries no route branding. 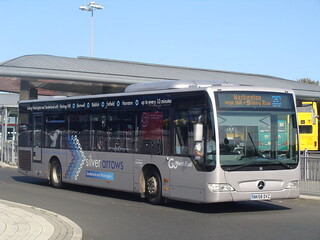 In line with a major network review in Sunderland due to take place from 25th January 2015, the "Silver Arrows" brand name will be withdrawn, with the revised 2/2A services instead operated by "SimpliCity" branded Optare Versas. 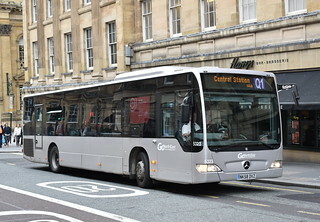 As there will be an increase in the number of Optare Versas required to operate the revised 2/2A services, "SimpliCity" service 61 will instead be allocated Mercedes Citaros 5320 - 5324, with a new 'shopper hopper' style brand introduced on a silver base. As such; ahead of these changes, this vehicle has now been repainted into a plain silver base livery. This vehicle has received "Silver Arrows" branding, with sub-branding for services 2A/2C. The new and improved 10-minute frequency has been added to the cant rail, promoting the more regular service provided between Sunderland City Centre and Washington, via Chester Road and Penshaw. 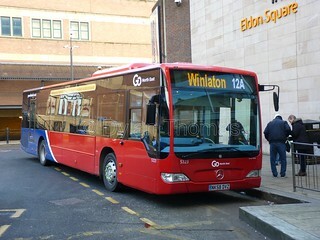 With the operation of "Silver Arrows" services 2A/2C transferring to Deptford Depot, this vehicle has also transferred from Washington Depot to Deptford. 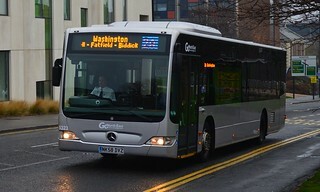 This vehicle has entered service at Washington Depot on "Silver Arrows" services 2A/2C. Introduced from 26th October 2008; these services have partly replaced the old 73/74 circular services, with the link to Teal Farm in Washington being withdrawn due to low passenger numbers, and replaced by a new Go North East secured service operating under contract to Nexus. Prior to entering service; this vehicle has received "Silver Arrows" branding, with sub-branding for services 2A/2C. 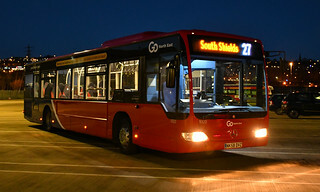 The "Silver Arrows" brand name has been introduced to complement the well-established "Red Arrows" service - together with the "Red Arrows" X2 service, the "Silver Arrows" 2A/2C services will provide a luxury bus service every ten minutes between Sunderland, Hastings Hill and Washington.